Cowboy-style lead flat-nose bullets, made at the right price. Magtech Cowboy Action Loads, .45 Colt, LFN, 200 Grain, 50 Rounds is rated 4.8 out of 5 by 48. Rated 5 out of 5 by Putnambuck from GREAT AMMO GREAT PRICE Love shooting this out of my Smoke Wagon Deluxe. My order shipped fast and free! Rated 5 out of 5 by qtip from Great price, good ammo. They work great in my replica 1873 rifle. 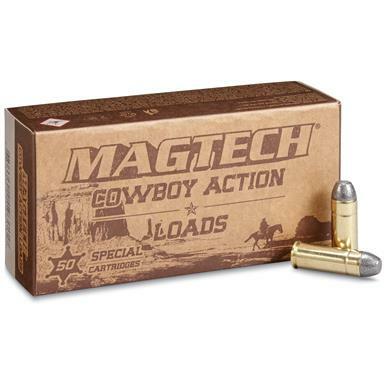 Rated 5 out of 5 by Jim1945 from Ammo at a Great Value This ammo is a great cowboy action round. I recommend this ammo for all cowboy shooters. It is an exceptionally good value when free shipping is included by Sportsman's Guide. I cannot beat this price with free shipping in my local area. Thanks, Sportsman's Guide for offering a great cowboy load at such a superior value. Rated 4 out of 5 by Denny from fun and accurate shoots well, and is accurate. Rated 5 out of 5 by treeman from depenable ammo! Great price - free shipping - good ammo -Can't beat it !!! !